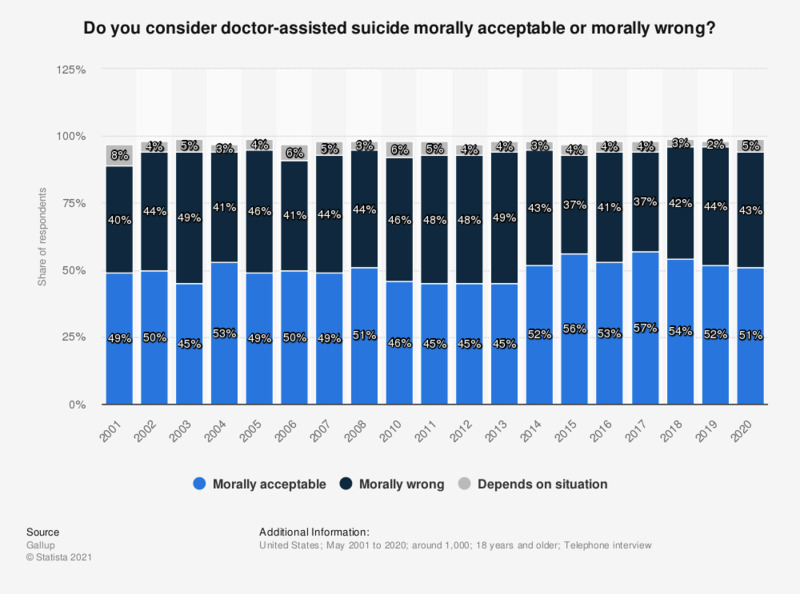 This statistic shows the moral stance of Americans regarding doctor-assisted suicide from 2001 to 2018. In 2018, 54 percent of respondents stated that they think doctor-assisted suicide is morally acceptable, while 3 percent said it depends on the situation. Percentages may not add to 100 due to those answering "not a moral issue" or "no opinion". According to you, to which extent are the parent-child relations responsible for the diffusion of the phenomenon of games leading to suicide or physical harm? Would you support or oppose a proposed change in the law to allow someone with a terminal illness to end their life? Do you consider cloning humans morally acceptable or morally wrong? Do you consider cloning animals morally acceptable or morally wrong? What do you think - how much of a factor did racial bias play in the shooting of Trayvon Martin?